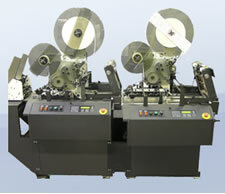 The Secap® Jet 1 Dual Tabbing production system accommodates the two tab/one tab requirement for leading (toe) and trailing edges (heel) for booklet mail in a single pass. Designed for in-line or off-line tabbing. The dual tabber machine can run as a system or the integrated units can be unlocked and used as standalone units.